CMU SCS 15-826: Multimedia Databases and Data Mining Lecture #7: Spatial Access Methods - Metric trees C. Faloutsos. 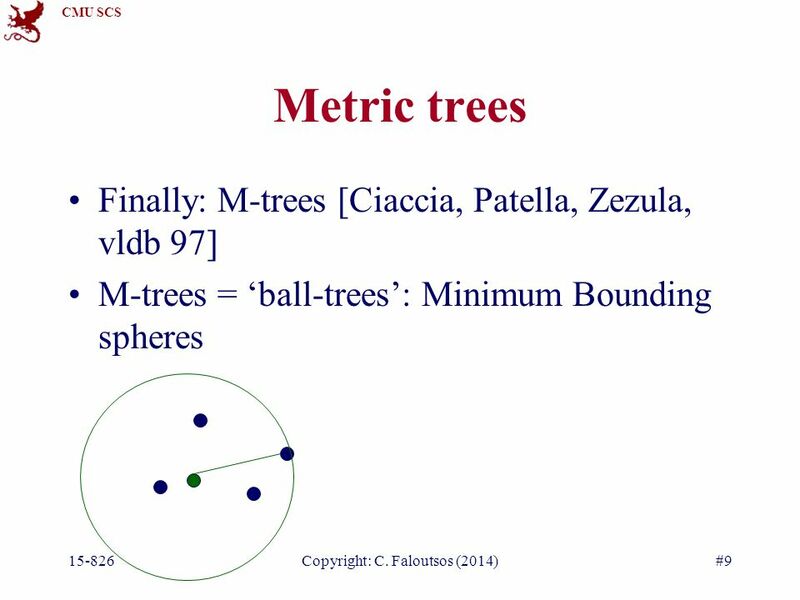 25 CMU SCS 15-826Copyright: C. Faloutsos (2014)#25 References Aurenhammer, F. (Sept. 1991). “Voronoi Diagrams - A Survey of a Fundamental Geometric Data Structure.” ACM Computing Surveys 23(3): 345-405. Bentley, J. L., B. W. Weide, et al. (Dec. 1980). “Optimal Expected-Time Algorithms for Closest Point Problems.” ACM Trans. on Mathematical Software (TOMS) 6(4): 563-580. Burkhard, W. A. and R. M. Keller (Apr. 1973). 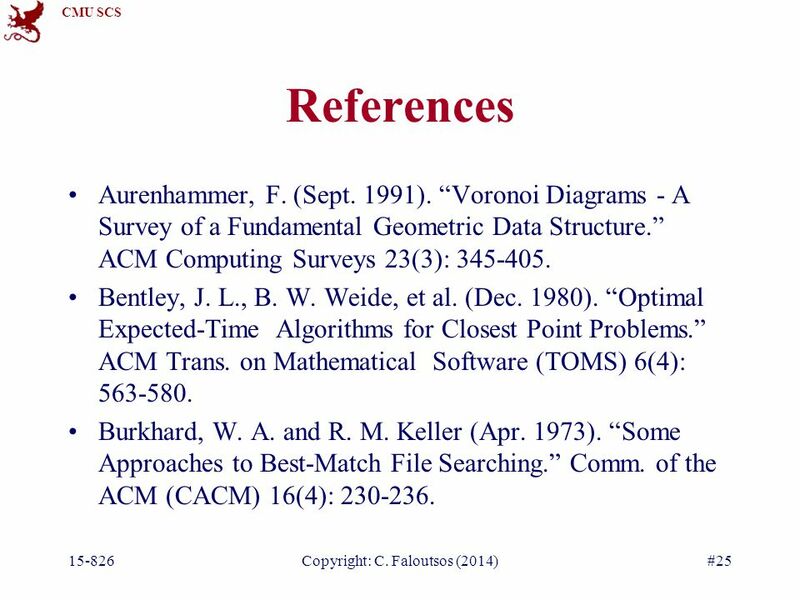 “Some Approaches to Best-Match File Searching.” Comm. of the ACM (CACM) 16(4): 230-236. 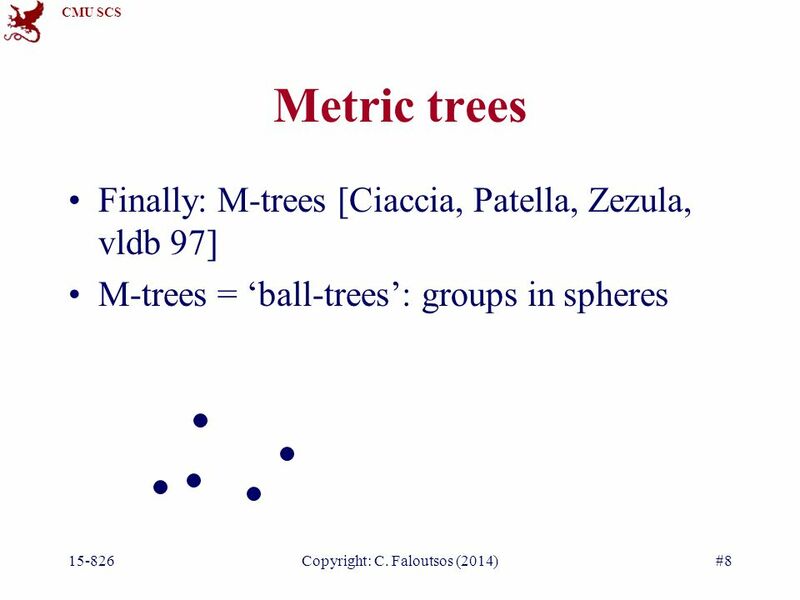 27 CMU SCS 15-826Copyright: C. Faloutsos (2014)#27 References Ciaccia, P., M. Patella, et al. (1997). 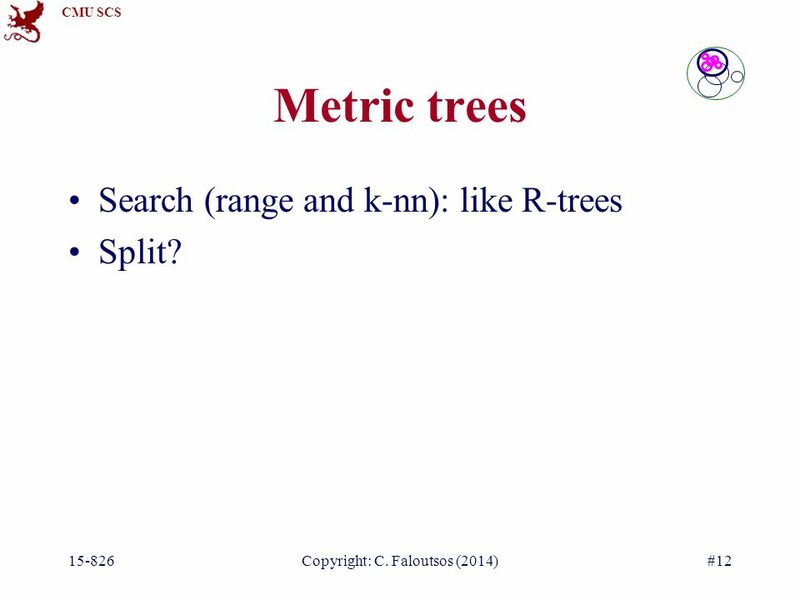 M-tree: An Efficient Access Method for Similarity Search in Metric Spaces. VLDB. Filho, R. F. S., A. Traina, et al. (2001). 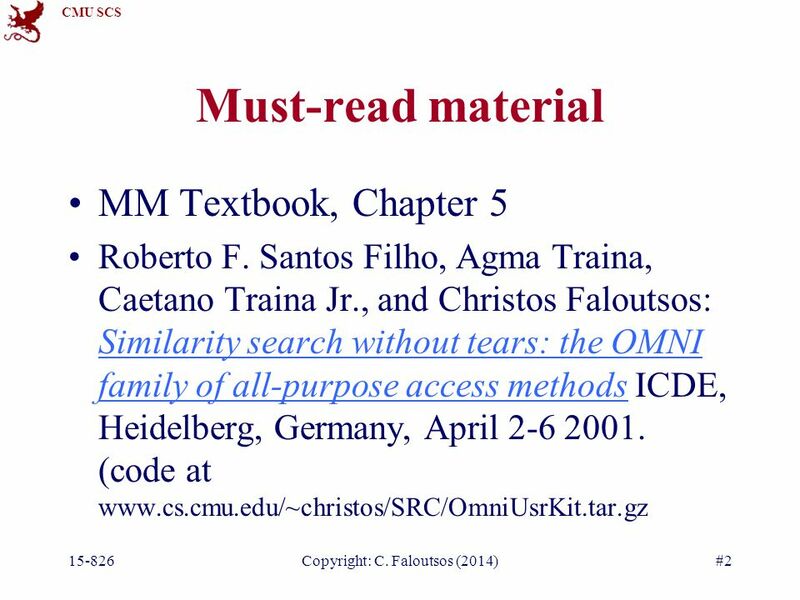 Similarity search without tears: the OMNI family of all-purpose access methods. ICDE, Heidelberg, Germany. Friedman, J. H., F. Baskett, et al. (Oct. 1975). 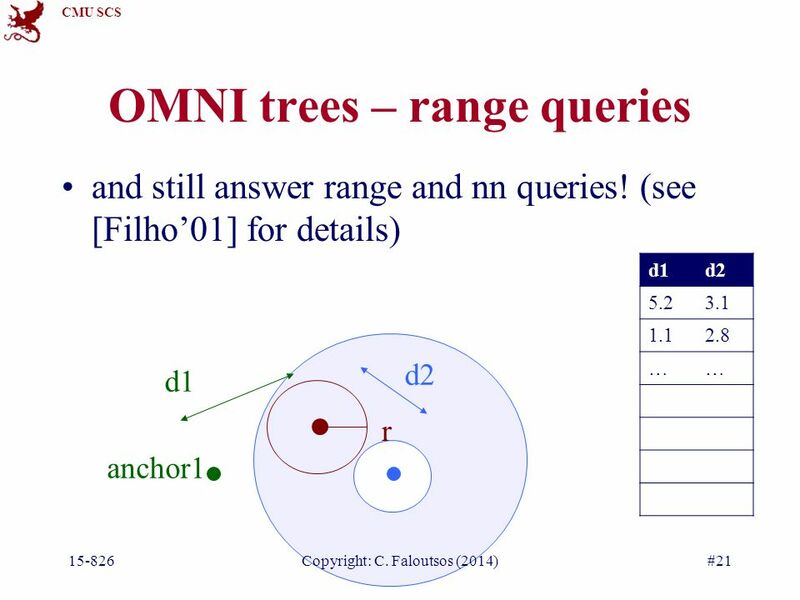 “An Algorithm for Finding Nearest Neighbors.” IEEE Trans. on Computers (TOC) C-24: 1000-1006. 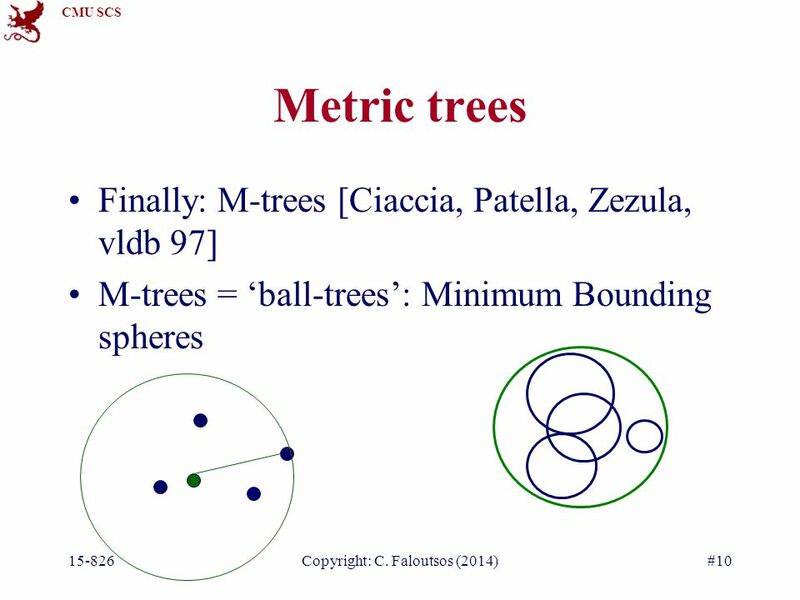 28 CMU SCS 15-826Copyright: C. Faloutsos (2014)#28 References Fukunaga, K. and P. M. Narendra (July 1975). 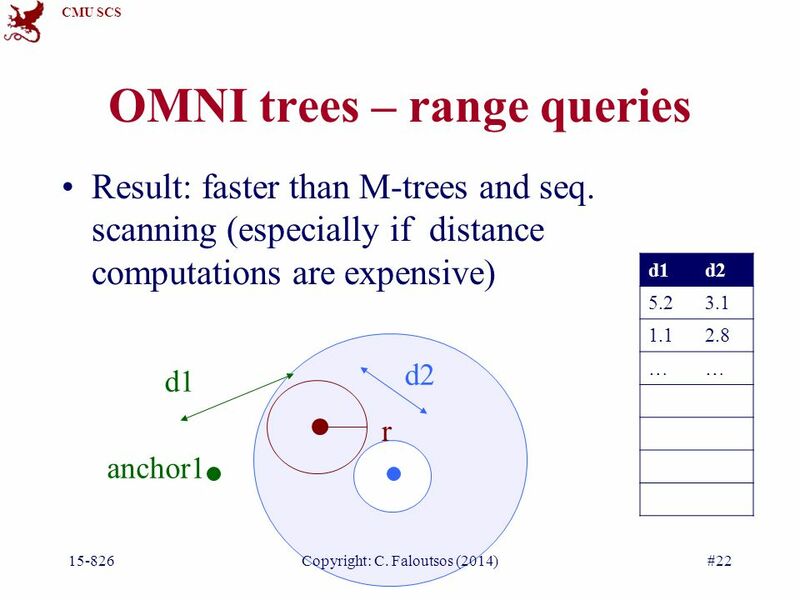 “A Branch and Bound Algorithm for Computing k-Nearest Neighbors.” IEEE Trans. on Computers (TOC) C-24(7): 750-753. Shapiro, M. (May 1977). 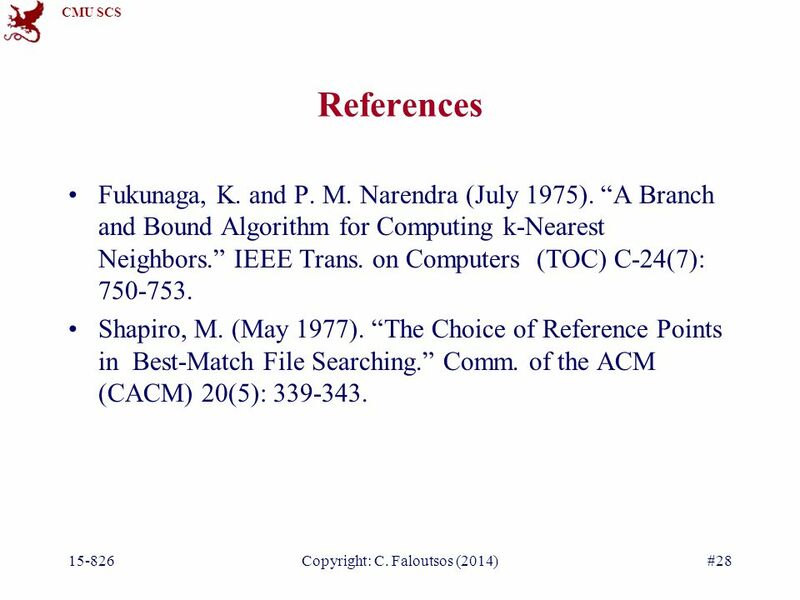 “The Choice of Reference Points in Best-Match File Searching.” Comm. of the ACM (CACM) 20(5): 339-343. 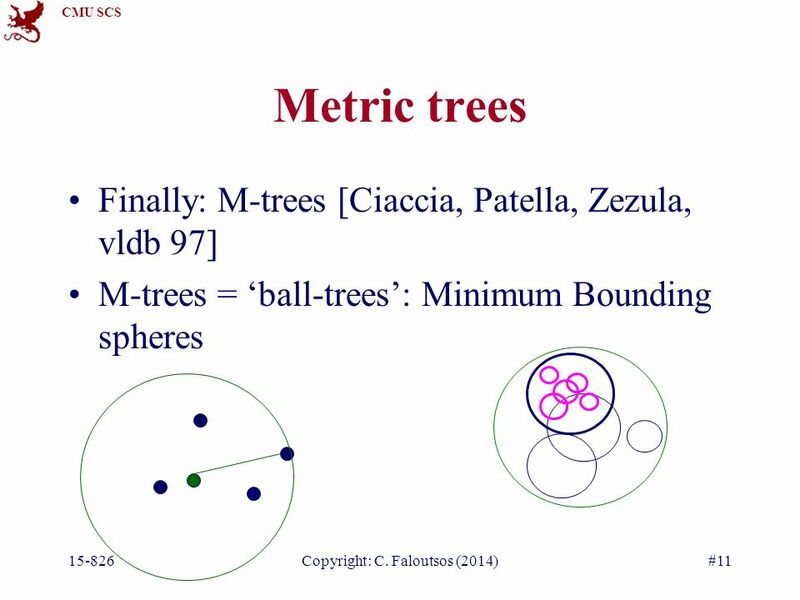 29 CMU SCS 15-826Copyright: C. Faloutsos (2014)#29 References Shasha, D. and T.-L. Wang (Apr. 1990). 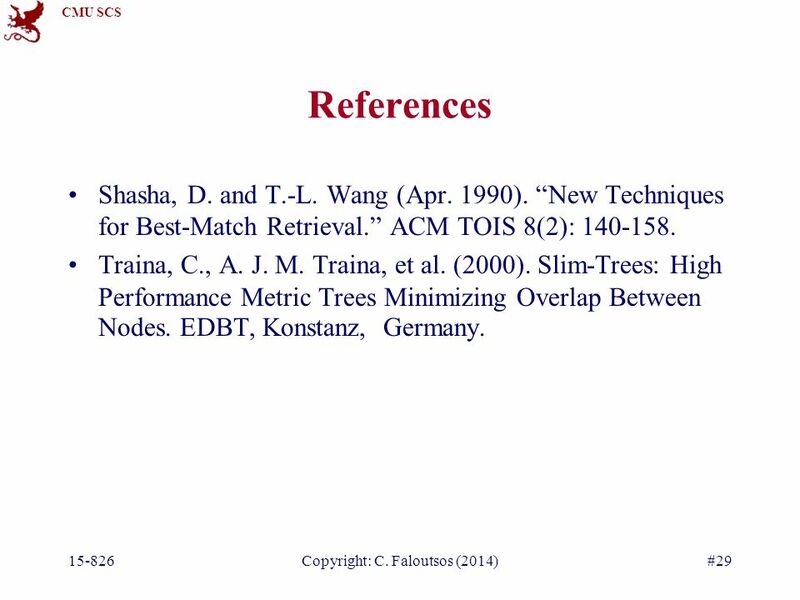 “New Techniques for Best-Match Retrieval.” ACM TOIS 8(2): 140-158. Traina, C., A. J. M. Traina, et al. (2000). 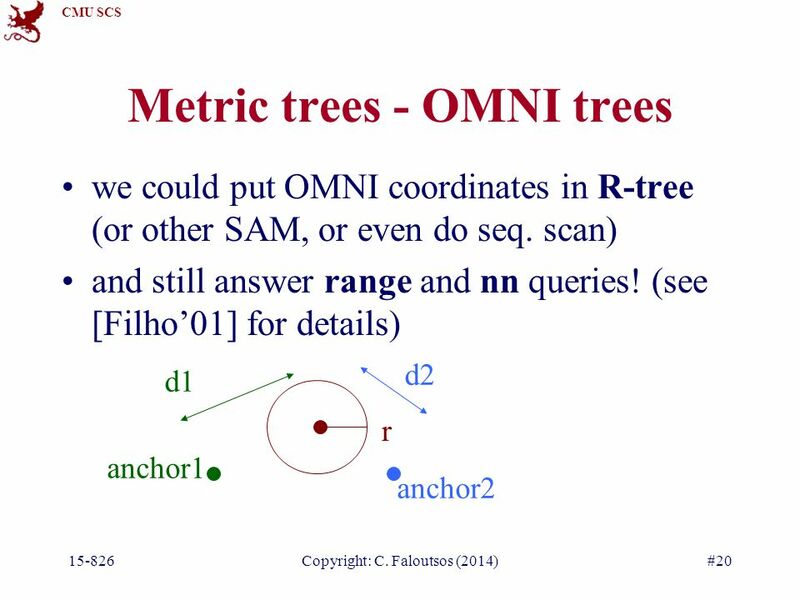 Slim-Trees: High Performance Metric Trees Minimizing Overlap Between Nodes. EDBT, Konstanz, Germany. 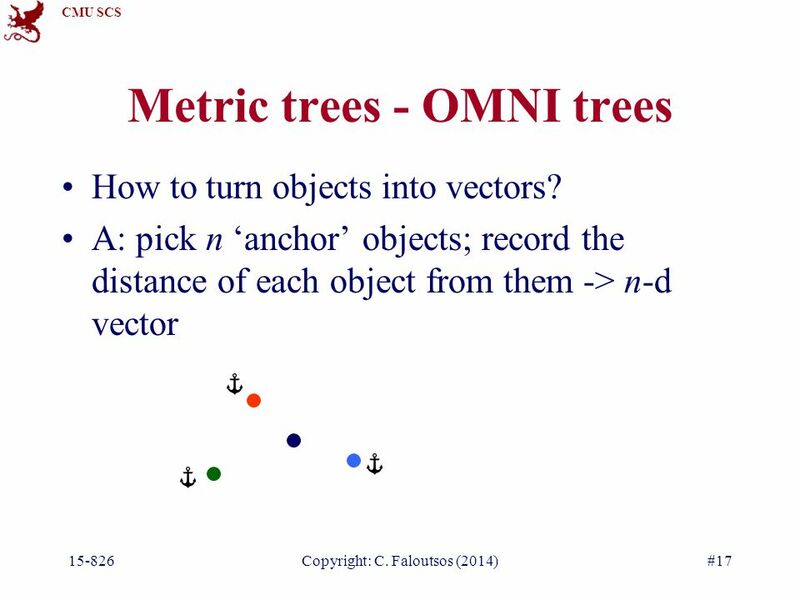 Download ppt "CMU SCS 15-826: Multimedia Databases and Data Mining Lecture #7: Spatial Access Methods - Metric trees C. Faloutsos." 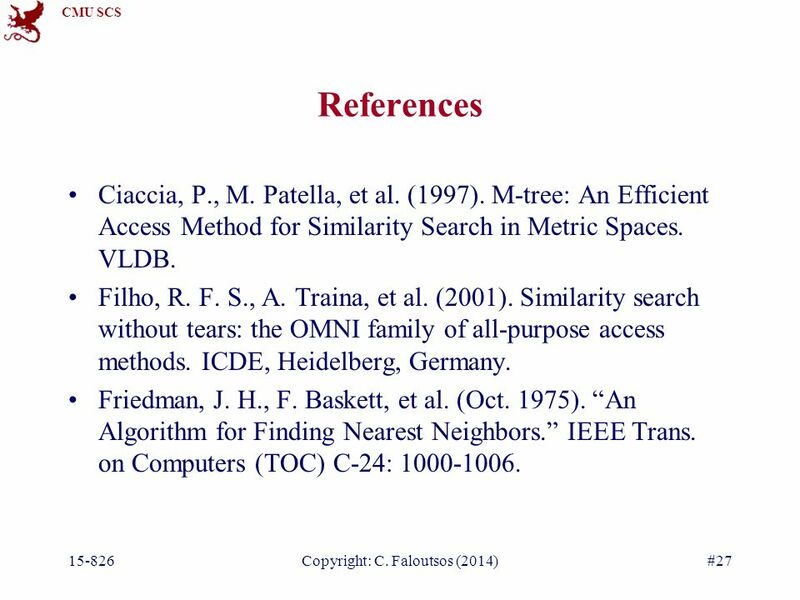 Multidimensional Index Structures One dimensional index structures assume a single search key, and retrieve records that match a given search-key value. 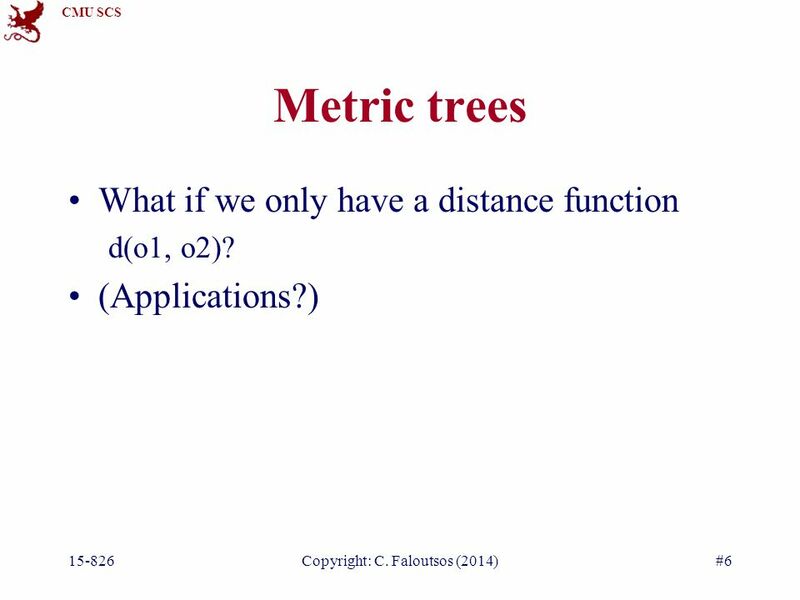 CMU SCS : Multimedia Databases and Data Mining Lecture #17: Text - part IV (LSI) C. Faloutsos. Hagenberg -Linz -Prague- Vienna iiWAS 2002, September, Bandung, Indonesia, Page 1 -ISA: AN INCREMENTAL LOWER BOUND APPROACH FOR EFFICIENTLY FINDING. 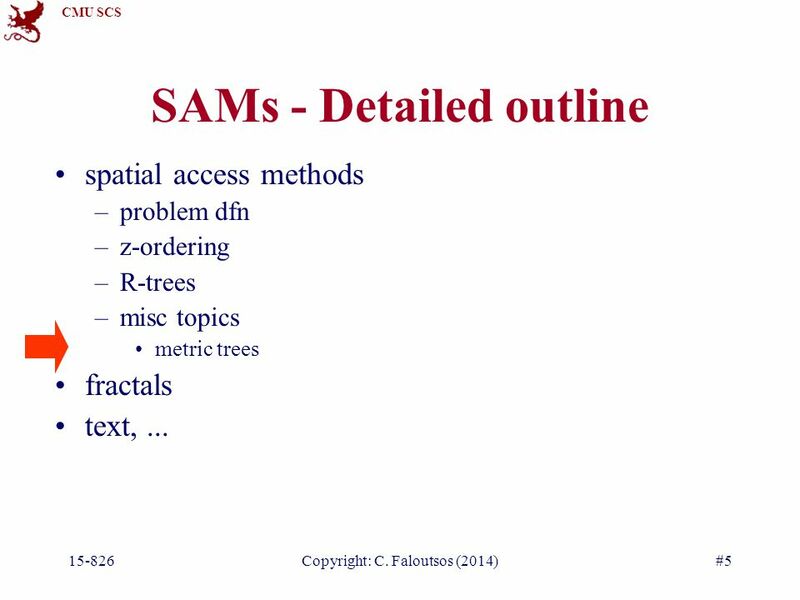 CMU SCS : Multimedia Databases and Data Mining Lecture #7: Spatial Access Methods - IV Grid files, dim. curse C. Faloutsos. 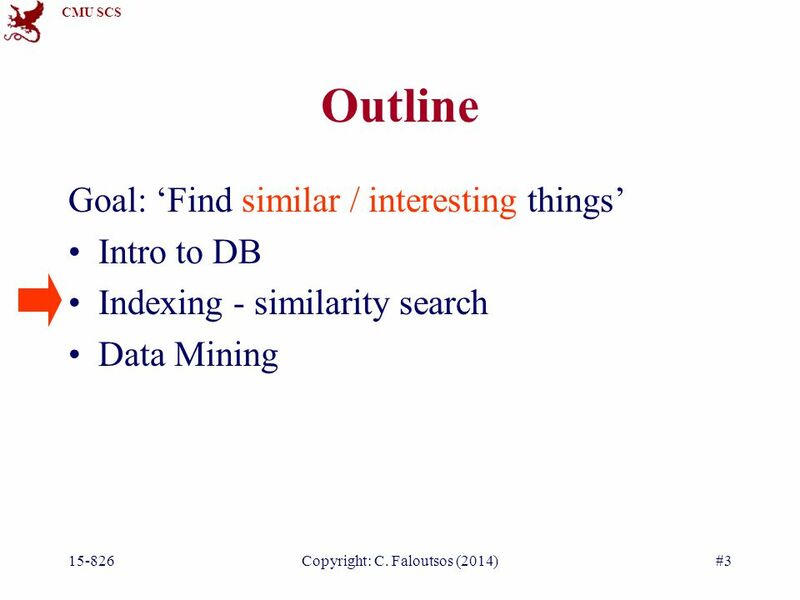 CMU SCS : Multimedia Databases and Data Mining Lecture #14: Text – Part I C. Faloutsos. On Reinsertions in M-tree Jakub Lokoč Tomáš Skopal Charles University in Prague Department of Software Engineering Czech Republic. 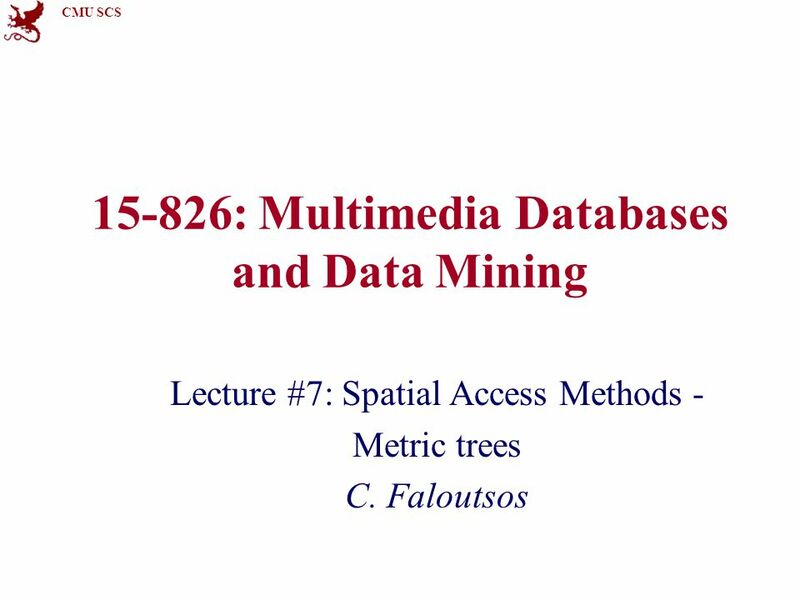 CMU SCS : Multimedia Databases and Data Mining Lecture #4: Multi-key and Spatial Access Methods - I C. Faloutsos. 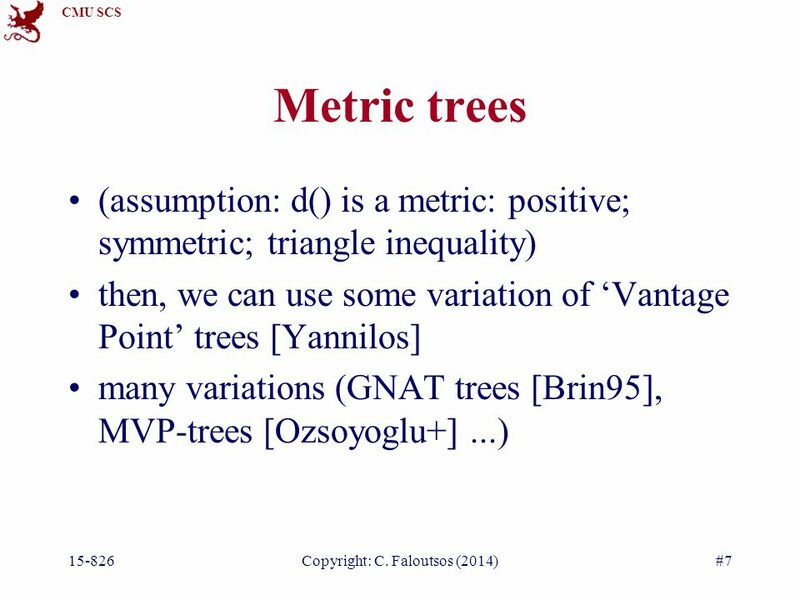 CMU SCS : Multimedia Databases and Data Mining Lecture #19: SVD - part II (case studies) C. Faloutsos. 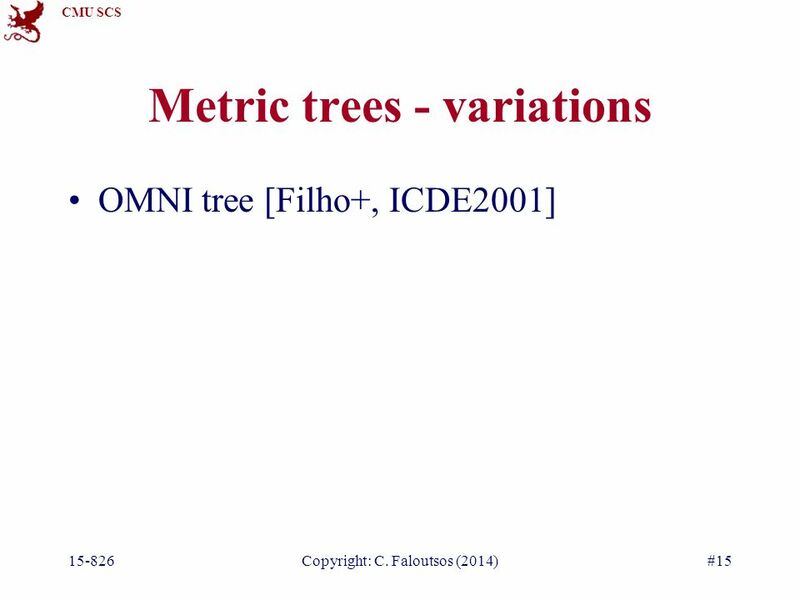 CMU SCS : Multimedia Databases and Data Mining Lecture #11: Fractals: M-trees and dim. curse (case studies – Part II) C. Faloutsos. 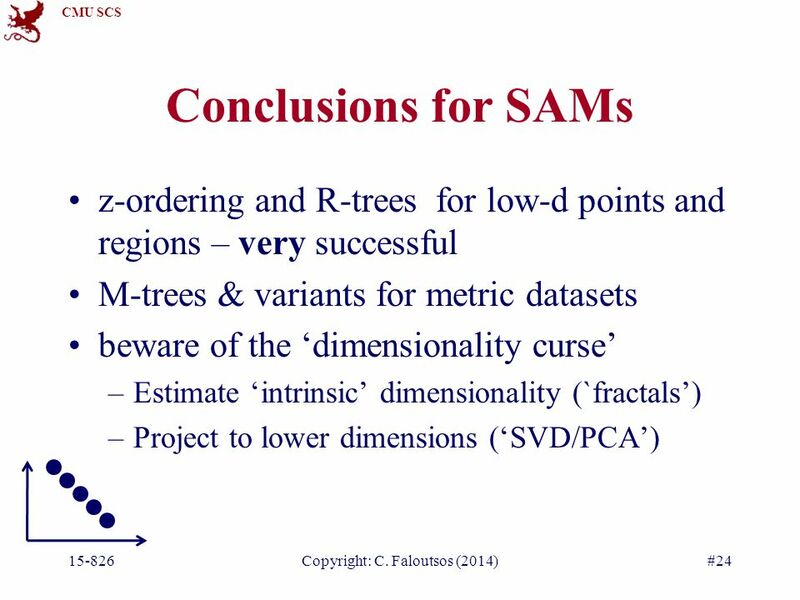 Spatial Indexing SAMs. 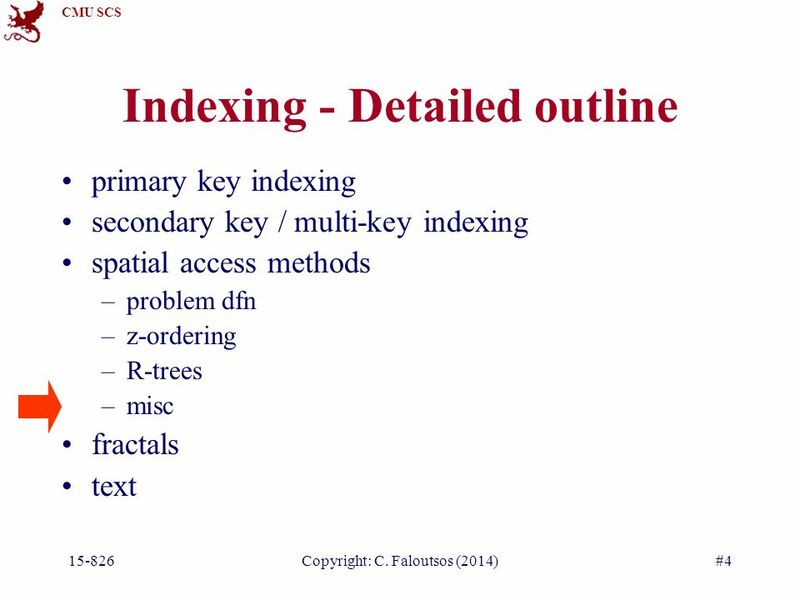 Spatial Indexing Point Access Methods can index only points. What about regions? Z-ordering and quadtrees Use the transformation. 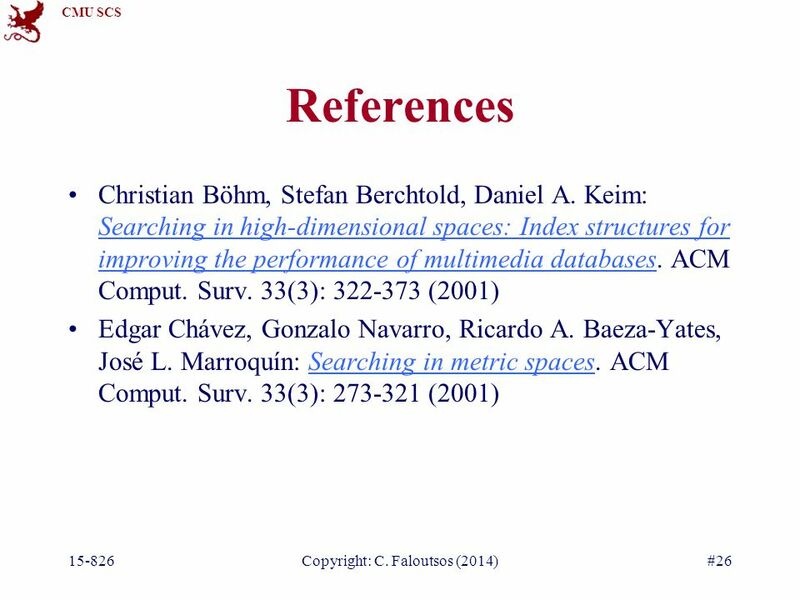 Proximity Searching in High Dimensional Spaces with a Proximity Preserving Order Edgar Chávez Karina Figueroa Gonzalo Navarro UNIVERSIDAD MICHOACANA, MEXICO. 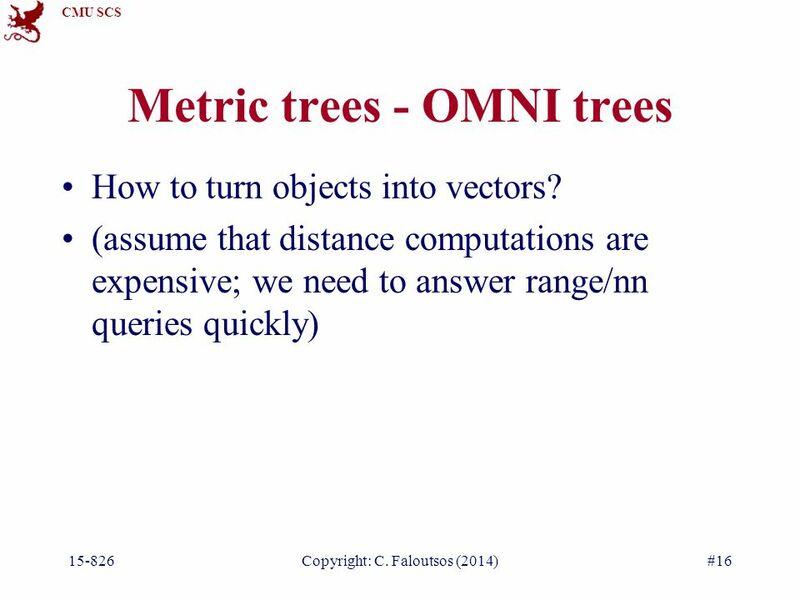 CMU SCS : Multimedia Databases and Data Mining Lecture #10: Fractals - case studies - I C. Faloutsos. 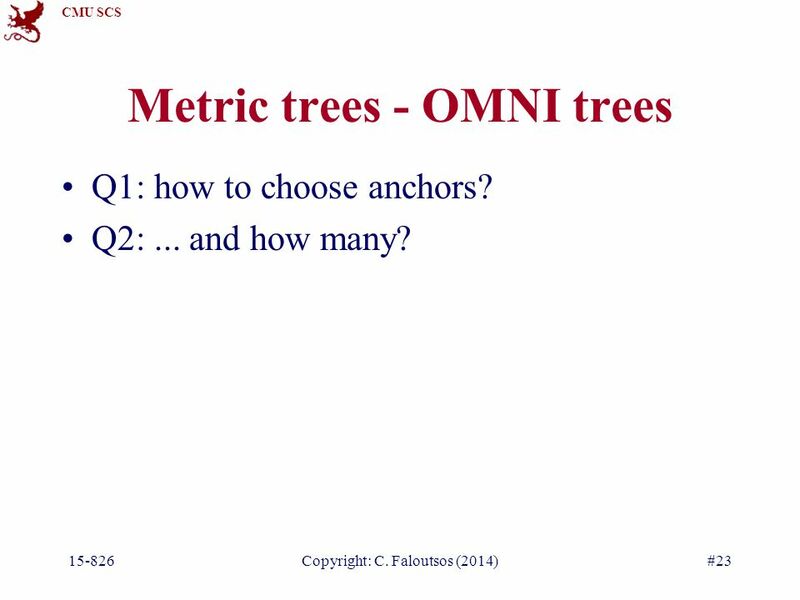 CMU SCS : Multimedia Databases and Data Mining Lecture#5: Multi-key and Spatial Access Methods - II C. Faloutsos. 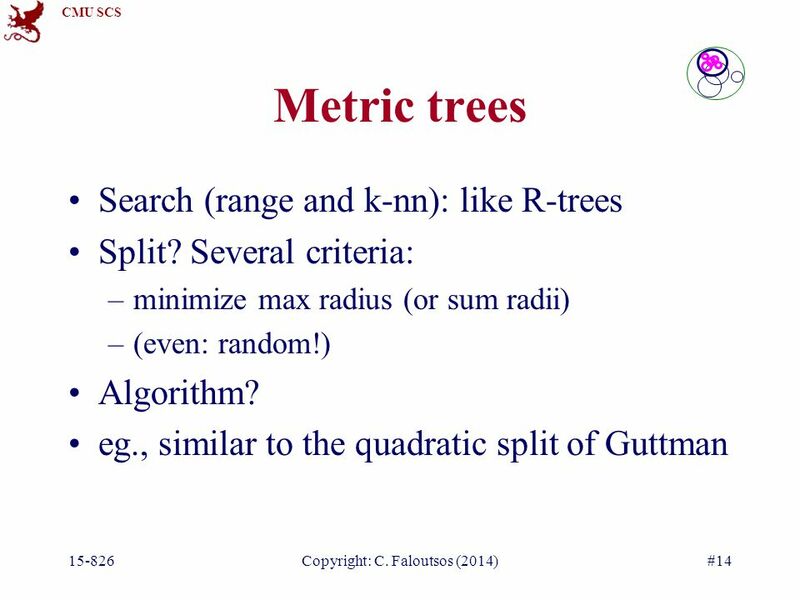 Reference-based Indexing of Sequence Databases Jayendra Venkateswaran, Deepak Lachwani, Tamer Kahveci, Christopher Jermaine University of Florida-Gainesville. 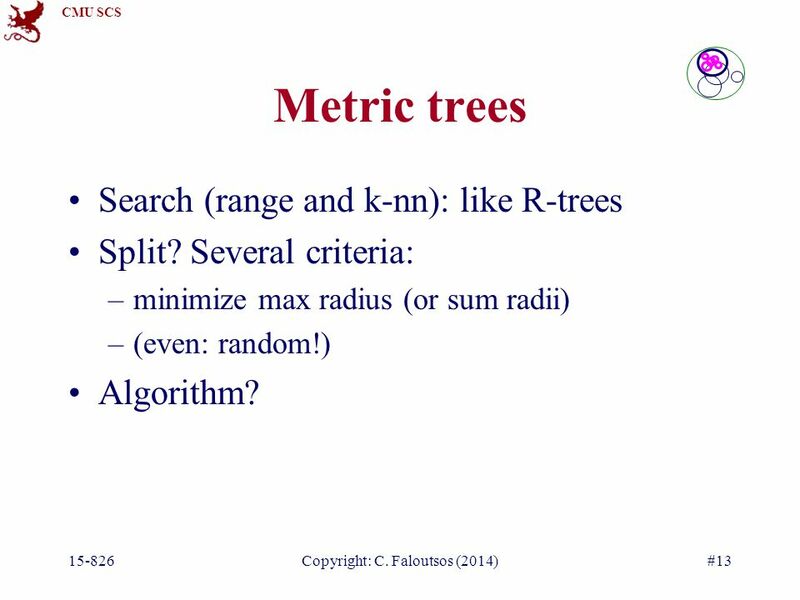 CMU SCS : Multimedia Databases and Data Mining Lecture#3: Primary key indexing – hashing C. Faloutsos. Hagenberg -Linz -Prague- Vienna iiWAS 2002, 10-12 September, Bandung, Indonesia, Page 1 -ISA: AN INCREMENTAL LOWER BOUND APPROACH FOR EFFICIENTLY FINDING.